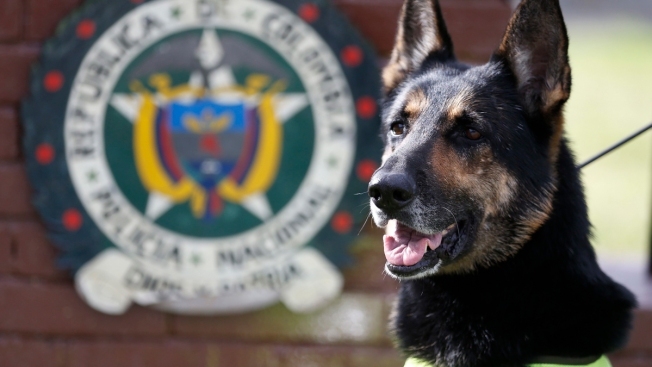 Drug dog Sombra has helped detect more than 2,000 kilos of cocaine hidden in suitcases, boats and large shipments of fruit, sits outside the police station in Bogota, Colombia, Thursday, July 26, 2018. Colombian police recently revealed that the Gulf Clan, a cartel that boasts its own guerrilla army, has offered a reward of $7,000 to whoever kills or captures Sambra. This is the story of a drug dog with a bounty on its head. After her six-hour shift is over, Sombra is transported in a van with tinted windows back to her kennel. She is usually accompanied by two armed guards.